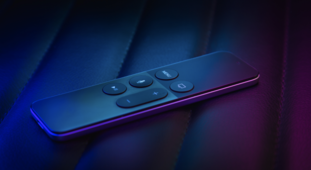 Apple TV models 4th generation and later can now be controlled via Bluetooth (BLE), which offers a better control experience and two great new features. The all-new trackpad feature makes it incredibly easy to browse and navigate (just like the trackpad on the Apple TV remote). You can also enjoy using a nifty new keyboard for searching (yes, you can finally say goodbye to spelling things out letter by letter on your TV screen). Check out the video below see these new features in action. Make sure your phone is connected to the same Wi-Fi network as Smart Remote. Launch the Sevenhugs Smart Remote app and make sure you are on the Devices & Service tab. Select “Add a device or service"
Select "Apple TV" in the list of devices found and press "Next"
Please select the Apple TV you want to add and press "Next"
Press "Continue on Smart Remote"
Please make sure both your Apple TV and Smart Remote are woken up before continuing to next steps. On your Apple TV, go to Settings and select "Remote & devices"
If you want the volume controls on your Apple TV interface to control the sound of your TV, you will need to create an AV Scene . To use the keyboard on Smart Remote to type into the search bar on your Apple TV, you need to tap the keyboard button on your Smart Remote interface for Apple TV.